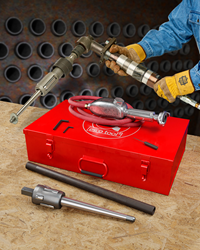 Esco Tool has introduced a new line of tube expander kits that feature rolling motors with adjustable torque to create a uniform and tight mechanical seal for repairing boilers. Supplied as kits for straight-, flare-, long-reach, and beaded rolls, a wide selection of adapters and universal pivoting extensions are available. These pneumatic rolling motors and tube expanders provide precise torque control from 25 to 325 ft.-lbs. and can be set to stall the tool when the desired tube expansion is met. Esco MILLHOG® Rolling Motor and Tube Expander Kits feature a rolling motor with adjustable torque control to prevent over and under expansion; assuring a tight and uniform bond between the tube and O.D. and the tube sheet. Supplied as kits for straight-, flare-, long-reach, and beaded rolls, a wide selection of adapters and universal pivoting extensions are available. Pneumatically powered, Esco MILLHOG® Rolling Motor and Tube Expander Kits provide precise torque control from 25 to 325 ft.-lbs. and can be set to stall the tool when the desired tube expansion is met. Available with 90-, 190-, and 280 RPM motors that operate on standard shop air, they are easy to adjust and ideally suited for rolling tubes from 5/8” to 4-1/2” O.D. Esco MILLHOG® Rolling Motor and Tube Expander Kits are offered for sale from $4,695.00 up or for rent at $295/wk; with 24-hour shipment available.